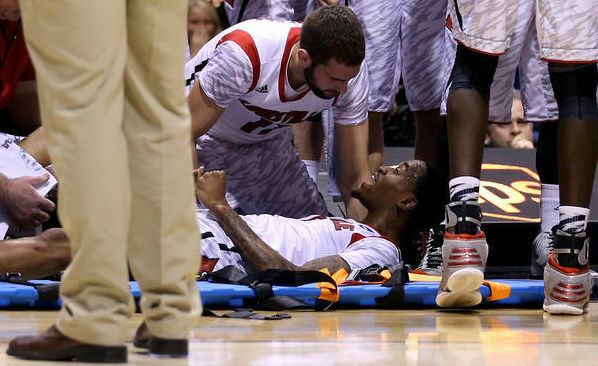 Louisville’s Kevin Ware suffered a terrible leg injury during a NCAA game against Indianapolis, leaving everybody who saw his fall frightened. Kevin jumped for a block, but landed badly, breaking his leg in front of his shocked teammates. Some started crying, and some said prayers while Kevin was treated on the court. “What a terrible fracture. Thankfully, the orthopedic surgeons involved were able to stabilize the compound fracture, wash it out, and put a rod there to fix it. The chance of infection is small but significant.”, Manhatthan Orthopedic Care’s physician Dr. Armin Tehrany said. Kevin, who said to his team just after the injury “just win it for me”, has since left the Indianapolis hospital, and is back in campus among his teammates. He is now in high spirits after the surgery to repair the compound fracture of the tibia in his leg. “Because Kevin is young and fit, he should do very well. The key is that his open fracture was likely very clean. Hopefully the underlying bone quality was normal prior to the fracture. Since his family and teammates will provide outstanding moral support, along with the rest of us cheering him on, could be back to full force next year… better than ever.”, Dr. Tehrany said. First steps will be the hardest to take, said Kevin who applauded the huge support he received from his fans and teammates while he was in the hospital. This entry was tagged basketball, compound fracture, Dr. Armin Tehrany, Kevin Ware, leg fracture, Luisville, Manhattan Orthopaedic Care, medical centers, MOCNYC, NBA, NCAA, neurological, New York orthopaedic, NY orthopeadic care, NYU medical center, professional care, shoulder injury, tibia. Bookmark the permalink.